The news that BJP President Amit Shah is down with swine flu and admitted to AIIMS hospital in the capital has triggered morbid glee in certain sections of the English-language mainstream media. 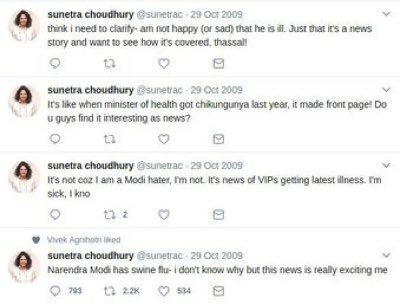 BJP President has swine flu.And this is the gleeful response of so called journalists in India.Quint lot & @sunetrac are old offenders. @maya206 joins the ranks to be cool. 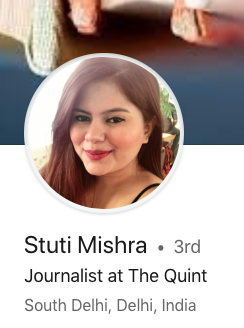 As per her LinkedIn profile, Mishra is currently employed as Social Media Manager with Raghav Bahl’s The Quint news media outlet. She was earlier working as a journalist with CNBC Network-18 channel (also earlier owned by Bahl, with Rajdeep Sardesai as Chief Editor). She has studied journalism at Xavier Institute of Communication, Mumbai and The London School of Economics and Political Science (LSE). Reacting to Mishra’s tweet was Sunetra Choudhary, who tweeted “Ok I am not reacting” followed by a rock-on and winky emoji. 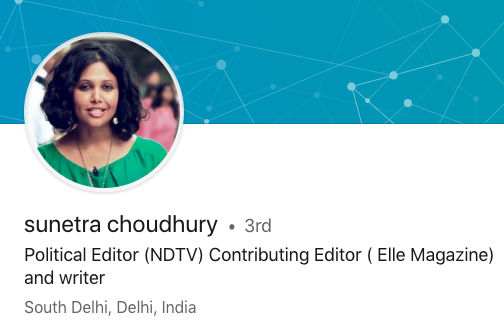 As per her LinkedIn profile, Sunetra Choudhury is a political editor with controversial Congress-leaning media outlet NDTV. Earlier, she was Deputy Chief Reporter with Indian Express (during the time Shekhar Gupta called the shots at IE). She has studied journalism at Indian Institue of Mass Communication (IIMC), Delhi and Cardiff University, UK. The 3rd news media professional to join in with the general merriment over Amit Shah contracting swine flu was senior journalist Maya Mirchandani, who responded to Sunetra Choudhary’s jibe with a tears of joy emoji. 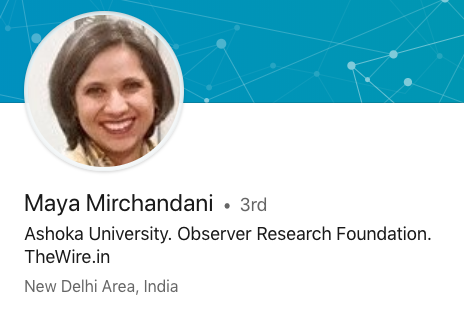 Her LinkedIn profile shows that Mirchandani currently hosts a show on the Hindu-baiting, far-left website TheWire.in, and is also a Senior Fellow with the pro-America Observer Research Foundation (ORF) think-tank and Adjunct Faculty at the uber-liberal Ashoka University’s media studies department. But most will remember her for her 23 year stint at NDTV. She has studied at Jesus & Mary college, Delhi; Sophia Polytechnic, Mumbai and London School of Economics and Political Science (LSE). The Quint appears to have a special talent for attracting columnists who harbour visceral hate for the current BJP leadership – Vikas Malhotra and Suprateek Chaterjee have both expressed a desire to see PM Modi assassinated or dead at the earliest. Harnidh Kaur, another columnist for Shekhar Gupta’s The Print had also wished to see the PM assassinated. Even a Times Now journalist, Prashant Kumar, has wished for the assassination of Modi. It remains to be seen what, if any action, the barely functioning self-regulatory news bodies like National Broadcasters Association (presided by NDTV Group executive vice chairman K. V. L Narayan Rao) or Editors Guild of India (presided by Shekhar Gupta) will take against the offending journalists who have taken their profession to a new low.